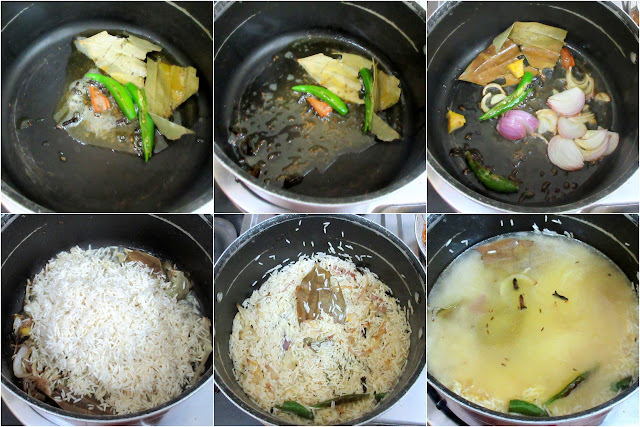 For the third and final day of making Rice Dishes, I have a layered Biryani. The clause of the theme was to cook Rice dishes in three different ways. As I said I do make these one pot meals, mixed rice and layered biryanis quite often. Only I didn't plan it properly and ended up making some in the same method and then later changed it to different themes. Only a week back I realized that I still have to cook one type. 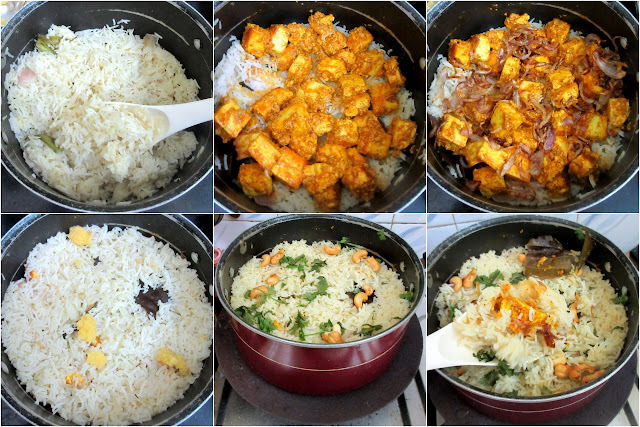 Luckily it turned out that I had another rice dish done and this biryani planned for the weekend. I announced to all that I was going to be making a biryani with Paneer. Kids were, of course, overjoyed hearing it and on hubby dear on the other hand, told me that he will eat out. I was two minds to change the menu, however, I had to make it for the theme and so there was no going back on the plans. However after high drama, Hubby dear said he will have this for lunch after seeing how inviting the plate looked. 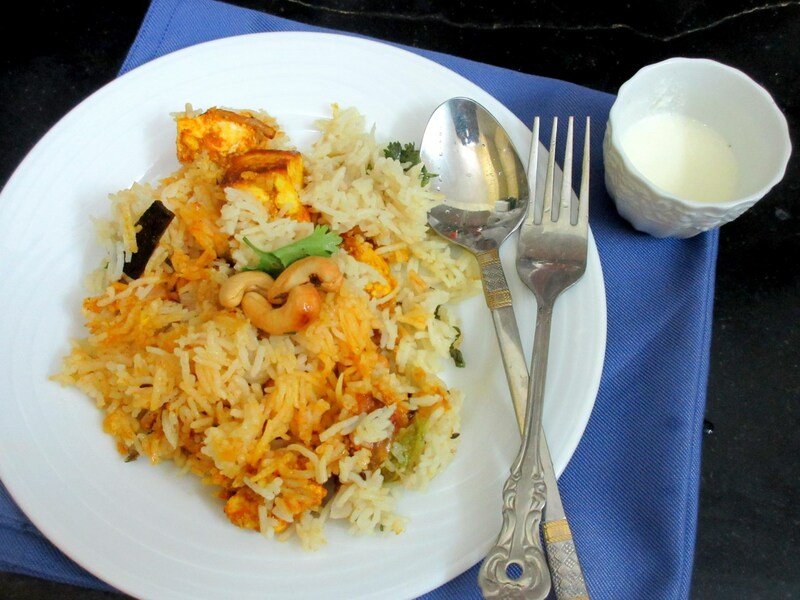 He said had he knew I was making the Nawabi Biryani style, he would have not planned out. Until that moment I had no name for this dish. Infact I didn't realise I was making this biryani somewhat similar to this Nawabi Chicken Biryani style, until he pointed out. 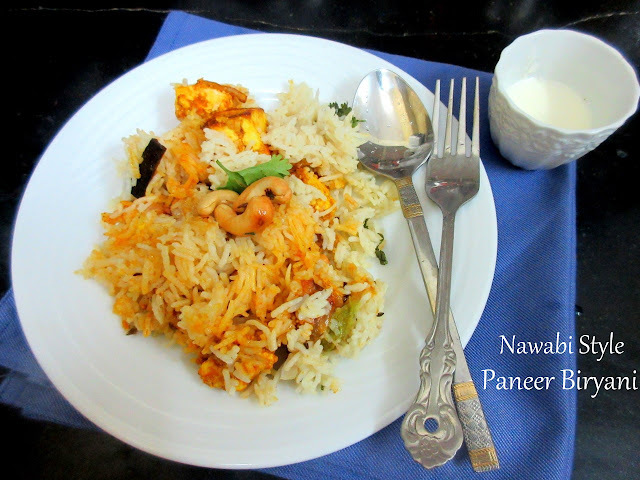 So I am calling it Nawabi Paneer Biryani. I do not claim that the Nawabi cuisine has this recipe, I am just going by the original recipe calling for all spices, curds and nuts. The biryani was so delicious and I know I will be repeating this soon. Deep fry onions till brown, keep it aside. Wash and soak the rice for 20 mins. In a nonstick pan, heat ghee, add all the whole spices, saute. Then add the slit green chilies, onions and fry well. Once the onions turn colour, add drained rice and salt. Saute for 2 mins. Then add water and bring to boil. Simmer and let it get cooked well. Cube the paneer pieces. 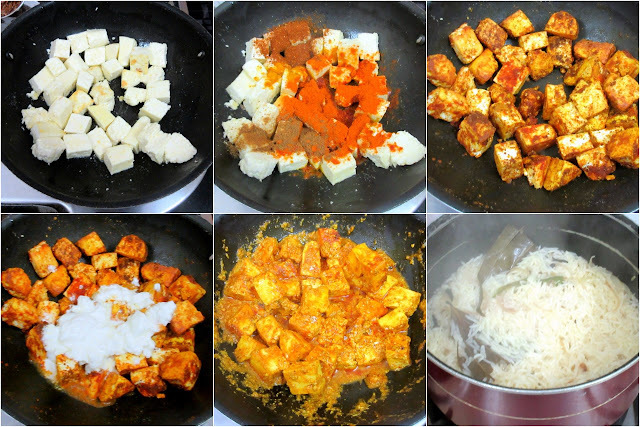 In a nonstick pan, heat ghee, add the paneer and all spice powders, combine. Cook for 5 mins. Then add the curds and combine. Let it simmer for 5 mins. From the rice pan, remove half the cooked rice. Fluff well and layer with the paneer gravy. Cover with the remaining rice layer. 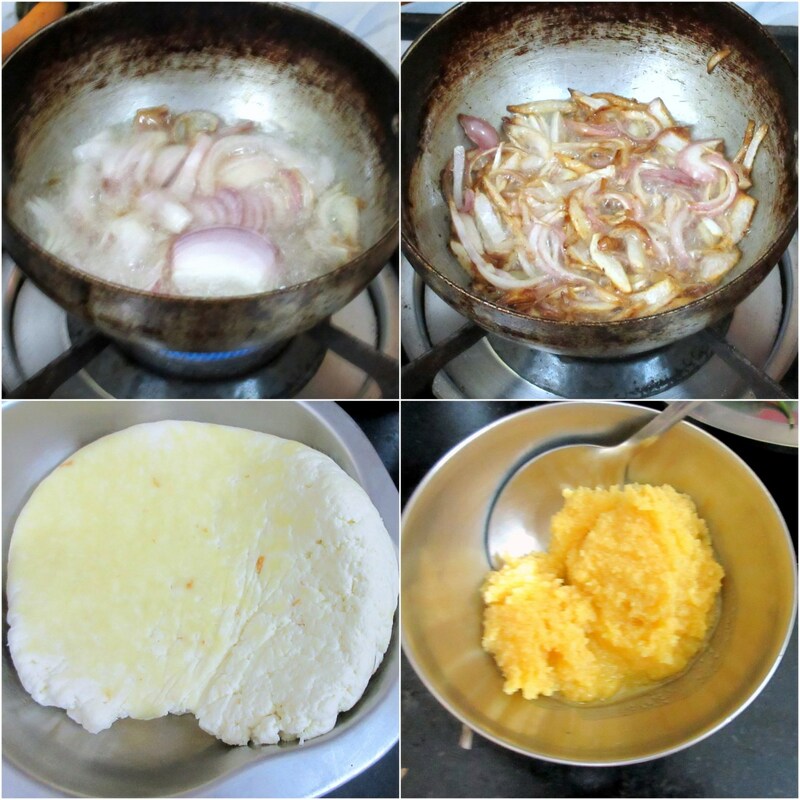 Top it with browned onions, coriander leaves, and cashews. Layer again with rice. 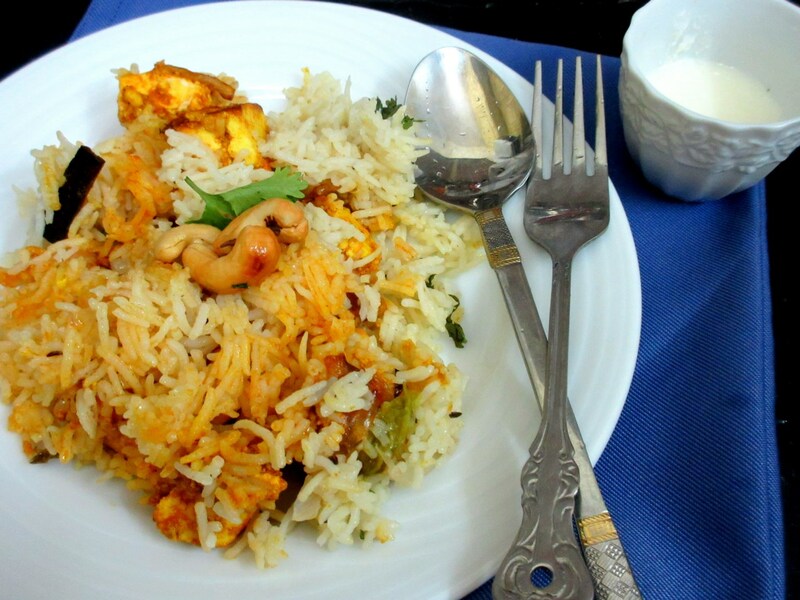 Top this with coriander leaves and cashews. While serving remember to scoop down so that you get the layers. If you want your rice not to end up mushy, remember to add 1/2 cup less when cooking rice and add milk when doing the Dum process.